Other supplies: sentiment stamp (“Kimmie’s Mermaid Sentiments” – Kraftin’ Kimmie Stamps) Stickles, embossing folder (Sizzix/Tim Holtz), foam tape, patterned paper (“Happy Day” mini pad – My Mind’s Eye), glitter brads, twine, rhinestones, Copic markers. For this term, our challenges are focused on movies and it will be an EITHER-OR-BOTH challenge. You can EITHER use the movie in the title as inspiration OR use the suggested theme or item. You may want to even kick it up a notch and use BOTH! We can’t wait to see your creativity with these challenges! When you have finished your card or project, visit the Drunken Stampers blog and click on the link for “Linky Tools” (it will open a separate window) and add your blog link, gallery link, etc. 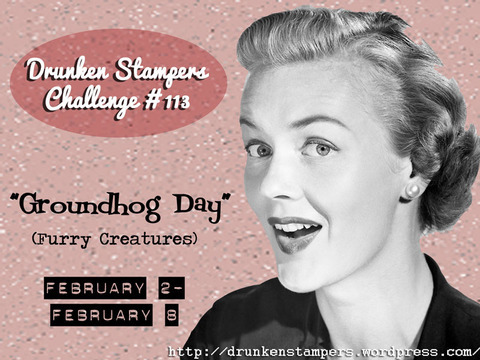 You have until Friday, February 15th at 11:59pm PST to post your link for this challenge. Thanks so much for stopping by! 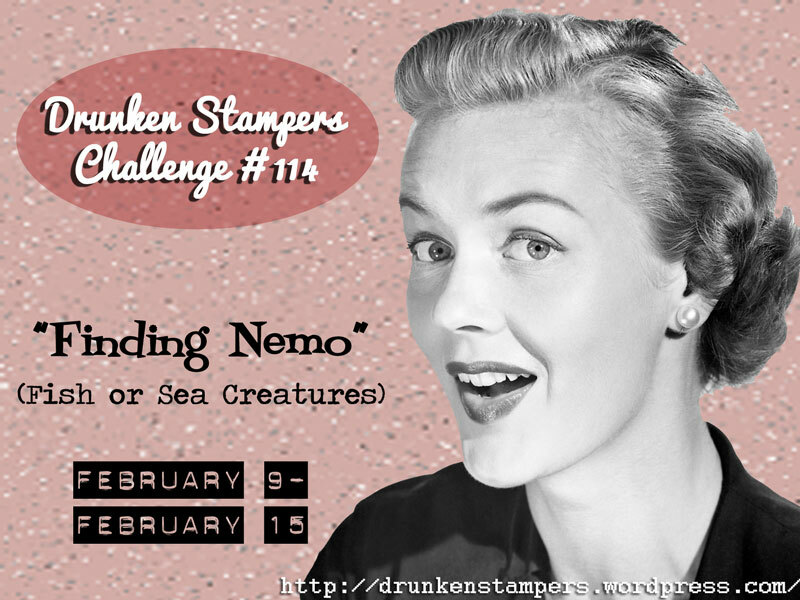 Visit the Drunken Stampers blog to see what the rest of the “Bahama Mamas” created for this challenge! We can’t wait to see what you’ll create! TGF Farm Fresh Friday: Buttons and Twine! 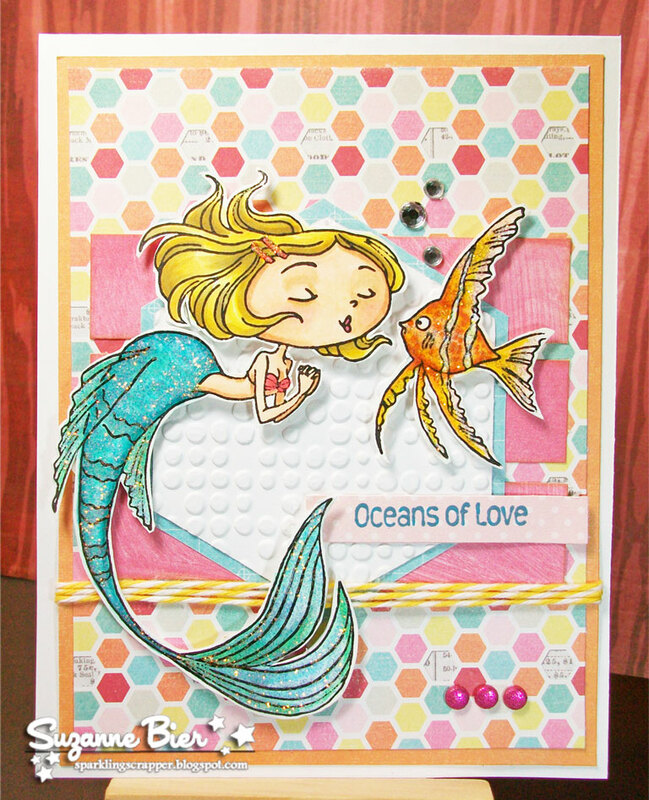 Love your mermaid card Suzanne!! I am totally digging the hexagons on that design paper! LOVE your card Suzanne! You have crazy mad coloring skills my fellow Drunken Stamper! This is awesome! Love the sparkle! I so love this stamp! Loving the embossing, that crazy awesome paper, and seriously, your amazing colouring!! !